Are you dreaming of your next vacation at one of the amazing beaches at the Caribbean coast of the Riviera Maya on the Yucatán Peninsula? Or have you booked your travel and you are already there, in Cancun, Playa del Carmen or Tulum? And now, after you have been there for a while, it get’s boring, sitting around in your resort or at the beach, day after day? You ask yourself: What else can I do at the Riviera Maya? What about a little bit of culture then? Why not visiting one or more of the famous Maya Sites. I promise you, visiting these places is worthwhile. This post is about those of the big sites that you can reach easily with a day trip or less. When the Spanish “Conquistadores” arrived in Yucatan 500 years ago, the Maya culture had already existed for more than 2000 years. However, they only found remnants of the once-flowering Maya civilization. Long before the arrival of the Spaniards, the decline had begun, and numerous ancient Mayan cities with gigantic pyramids and magnificent temples had already sunk in the jungle when the conquerors arrived. These Maya cities were scattered all over the peninsula, butsome of them were very close to the Caribbean coast. The eastern coast of the Yucatan Peninsula stretches for nearly 2000 km from north to south along the Caribbean coast of Mexico and Belize. From the island of Holbox in the north, along the tourist centers of Cancun, Playa del Carmen and Tulum, the coastline is called Riviera Maya. In less than 30 years, the landscape has been transformed from an almost uninhabited coastal landscape with small fisher villages into a booming tourist region with mega-cities, airports and hotels. Each year the area is visited by thousands of tourists from all over the world who spend their holidays there. Apart from the picturesque beaches and the warm waters of the Caribbean, there a many more entertaining possibilities to spend your holiday time. Diving and snorkeling in the Caribbean Sea, swimming and diving trips, freshwater-filled cenotes, living at or just visiting stately haciendas and colonial cities and, of course, numerous restaurants with the local cuisine, offer a change of scenery. But these are not the only ways to bring variety into your holidays. After all, you are in an area where probably the most advanced stone age culture, the Maya, left their magnificent structures, art, temples and pyramids. Some of these Maya settlements are now open for Tourists and offer the possibility for a day trip. The most important pyramid city in the Mayan region is undoubtedly Chichén Itzá. 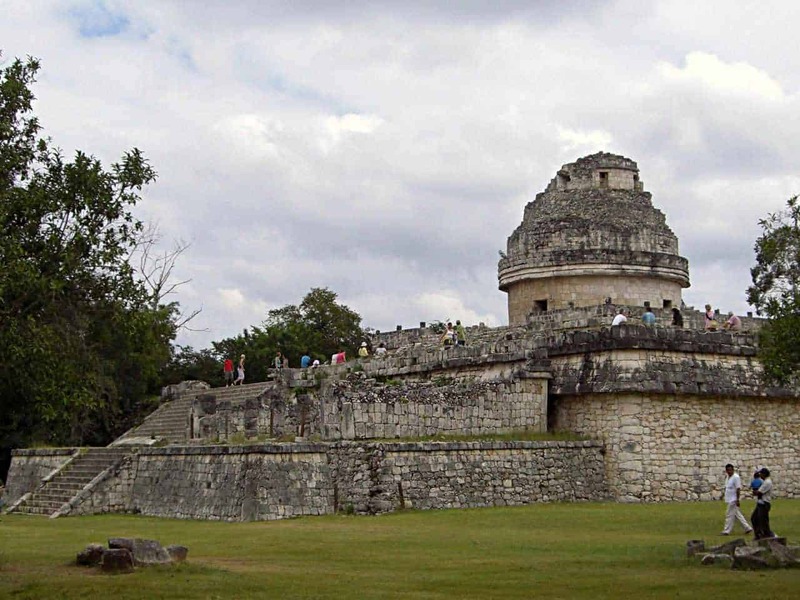 Most hotels or the small tourist offices offer in your holiday town offer day trips to Chichén Itzá. Chichén Itzá is well known for the superbly restored pyramid of Kukulkan, which is correctly called El Castillo. 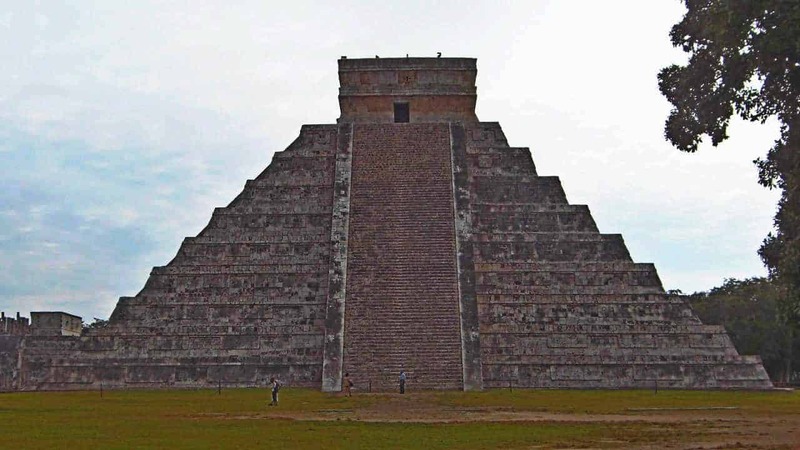 It was named pyramid of Kukulkan because of the temple of Kukulkan, which is on its upper platform. Kukulkan is a god of the ancient Maya who is often portrayed as a feathered serpent. It is the Mayan variant of the Aztec god Quetzalcoatl. The astronomical aspects of this building are interesting. At each of its 4 sides, a staircase with 91 steps leads upwards. Together with the uppermost base of the Kukulkan temple, the steps add up to the number 365, which corresponds to the days of a solar year. During the solstice the sun produces the impression of a snake descending at the edge of the pyramid. For some time it had been known, that there was an older building inside the Kukulkan pyramid. The builders of what is today’s visible pyramid had simply built over this older building. And recently, archaeologists have found that there is another, third temple inside the outer ones. One can therefore look forward to more important discoveries in Chichén Itzá. But this is not the only imposing building on site. There is also the Temple of the Warriors. Like “El Castillo” it has another temple in its interior. Directly next to it you can find the square of the thousand pillars and the observatory, also called snail tower. You should not miss the large water-filled cenote, the Cenote Sagrada. The priests of the ancient Maya used to sink their victims and to drown them in order to calm the gods at this place. In addition to the buildings mentioned, there are numerous smaller temples and palaces on the site of Chichén Itzá. In order to visit Chichén Itzá in a most relaxing way, it is advisable to be at the entrance as early as possible. Be among the first to enter the area in the morning. During the day so many tourists reach this place that it becomes uncomfortable. 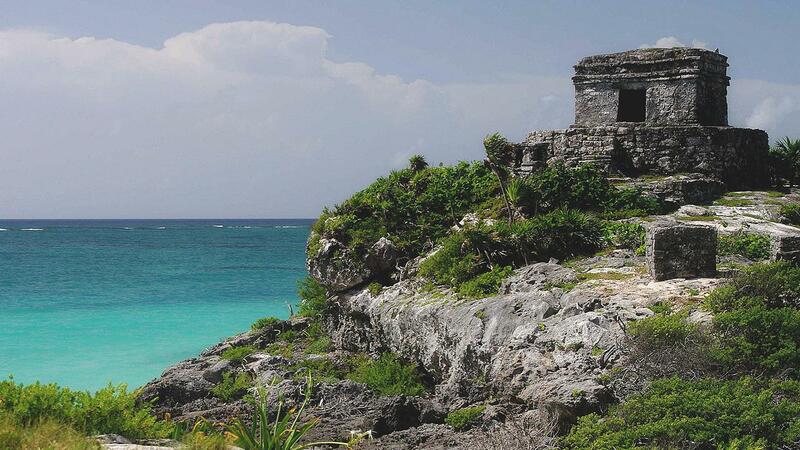 Almost as famous, but much smaller is the ancient Maya city of Tulum, located directly at the Caribbean coast. The small site is known very well in the world but became famous since teen star Justin Bieber ignored the barriers, entered one of the ancient temples and was kicked out in order by the site’s security guards. Tulum probably served as a port for the nearby Maya city of Cobá in the ancient times. The buildings are picturesque in front of the background with the turquoise colored sea, but are relatively small. A wall, some 5 meters high, divides the city from the surrounding jungle. The main town of the modern Tulum has largely been spared from tourism. Most accommodations are located at the beach, 2 km away from the town. Nevertheless, there are many small hotels and hostels in the town itself. The accommodations here are far cheaper than those of the beach resorts and the coast line can easily be reached by borrowed bikes. Cobá was a very large city of the Maya. It is located about 40 km from Tulum in the interior of the country. The area, which is accessible to tourists today, is so large that you even can rent a bike or a rickshaw with driver at the entrance to the complex. The paths within the complex are lined with dense forest, so that you usually walk in the shade. The highlight of Cobá is the great pyramid. Beside the one in Ek Balam, it is the only pyramid you are allowed to climb up in Northern Yucatan. And the pyramid of Cobá ist the highest pyramid at all in Northern Yucatán. The view over the jungle is impressive. You can see some other pyramid buildings at a distance, looking out of the dense green of the canopy. Two large lakes are located on the edge of the site area. Swimming is not recommended there, due to the crocodiles! Read More: >>> Cobá – ruled by women? 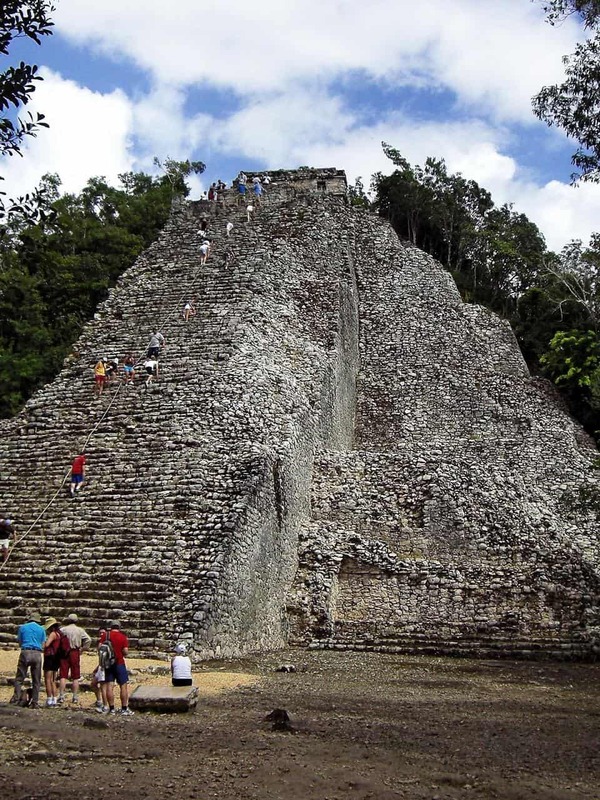 In Ek Balam, it is allowed to climb the great pyramid too. But like in Coba this is recommended for dizzy people only. The stairs are very narrow and much higher than usual stairs. The archway, the oval temple and the great Acropolis are the main buildings in Ek Balam. But the unquestionable highlight is the gigantic relief and the snake mouth gate, both halfway up on the left side of the pyramid. A large roof protects them from the tropical rain. 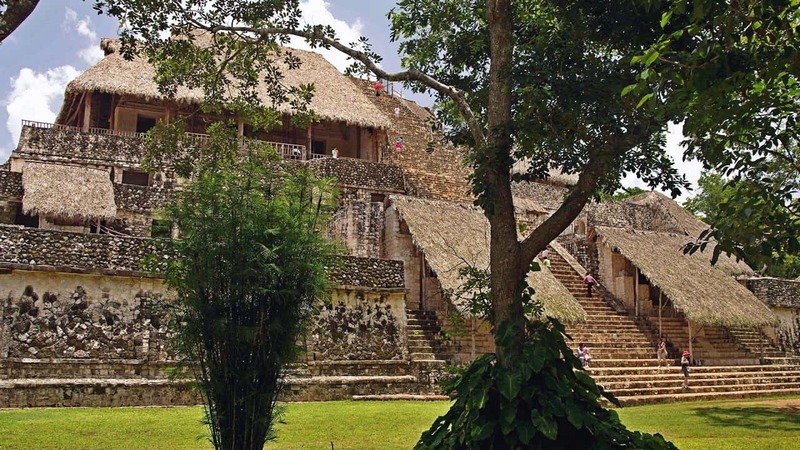 Ek Balam is located about 30 km north of Valladolid and can be easily reached from the Riviera Maya. 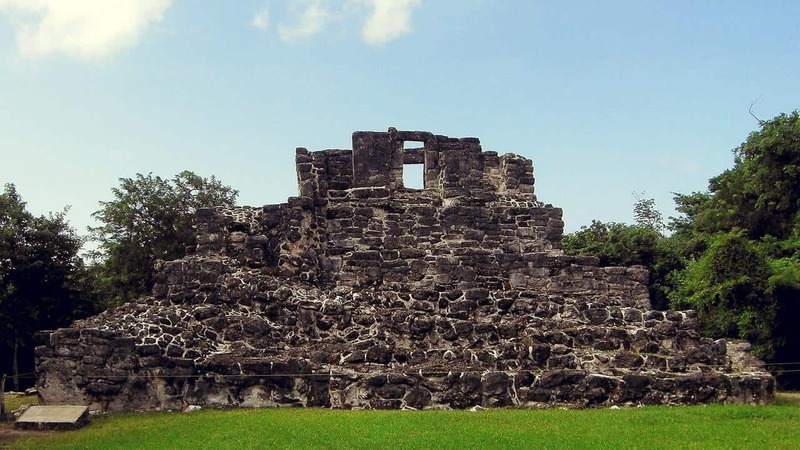 San Gervasio is a rather unknown Maya site on the island of Cozumel. Only a few tourists find their way there. The complex is relatively extended. So you have to walk a long way of several kilometers, if you want to see all the important buildings. The ancient buildings are rather small compared to the great pyramids of the mainland. Archway, small and big house are some of the important structures that you can visit here. However, San Gervasio was an important center of pilgrimage for the Maya, because they worshiped their goddess Ixchel here. Ixchel or sometimes written as Ix-Chel was the goddess of fertility in the ancient times. The island was the place where the Spanish conquerors first got in contact with the Maya civilization. Cozumel is only 45 minutes by ferry from Playa del Carmen. On the island you can use a taxi or rent a scooter to reach the site, that is located in the center of the island. 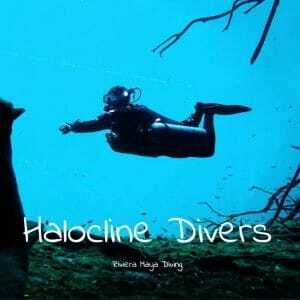 The east coast of the island is known as a diving paradise.